'Round here on the Eastern Shore, we pick a lot of crabs...and that means we have a lot of crab recipes. This is a tried and true recipe that comes from Diane, a family friend with a Bossy Italian Wife worthy attitude and a arsenal of recipes worth sharing. 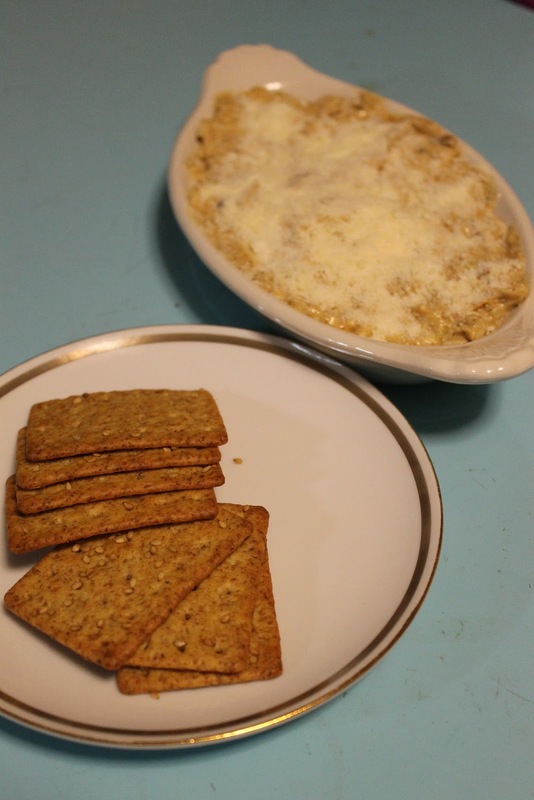 She introduced me to her [awesome] cold crab dip and with the holidays a-coming, you might want to whip this one out to impress your guests! Or you might want to make it and hoard it all to yourself. You might want to share it with just one or two people and eat it like it's contest...not that I did that, it's just an idea. Okay, maybe I might have done that. In any case, if you have a cup of crab meat, you can make this cold crab dip but don't expect it will last long. 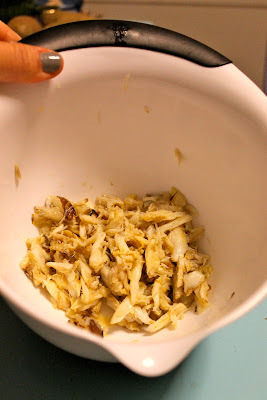 Here's my crab meat. I picked it in season and then I measured out 1 cup portions and froze it. It's really convenient...and you'd be surprised how far a cup a crab meat goes! Start by putting that in your bowl. 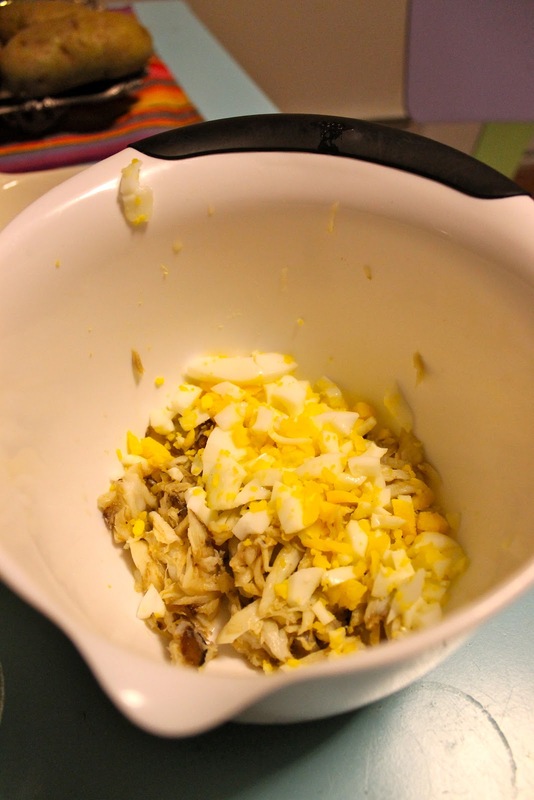 Then you are going to take a hardboiled egg and chop it up really good. And of course, add that to your bowl as well. Then I add 1 tablespoon of Old Bay seasoning which is a modification to Diane's recipe. I like the POW it adds. Just know if you aren't into Old Bay, or you can't find it where you live, you can leave it out...but if you can get it, add it! Now I'm adding in two tablespoons of mustard. The variety of mustard you use it totally up to you. I used a sweet hot variety of mustard that I really like. It's called, "Sweet Hot Mister Mustard." I mean, with a name like "Mister Mustard" I had to buy it. (I am a marketer's dream, I guess.) But you could use dijon or yellow--whatever you like! Now some mayo. Three [negotiable] tablespoons. By negotiable I mean just that--you can add more or less. This goes for the mustard too. 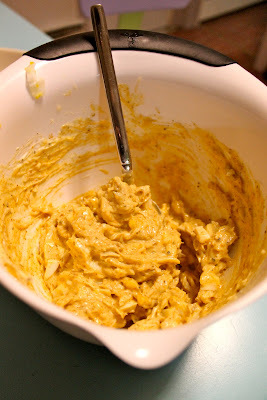 For instance, if you like more mustard and less mayo, do it up! You can do three tablespoons of mustard and two of mayo. If you like it less creamy, you can reduce it. Okay, I think you get the idea. Do some fresh pepper overtop and you are ready to mix it up! In case you were wondering why we haven't added any salt to it: there IS a reason. The Old Bay seasoning has plenty of salt in it. If you don't have Old Bay, you might you want to add a touch of salt. Now mix it all up until it's fully blended and yum-tastic! Then I stick it in a individual casserole dish. You can use whatever receptacle for holding dip you have. Now, it is time to finish your dip. Diane finishes her dip with poppy seeds which tastes great! I had to put my own Bossy Italian twist on it, though, and so I did: with parmesan cheese! Top generously with parmesan. Then you need to put it in fridge until you are ready to serve. I like to give it at least an hour, but you can leave it for several hours. It's a winner. Thanks Diane!!! In a mixing bowl add your crab meat. Chop your hardboiled egg finely. Add it to the crab meat. 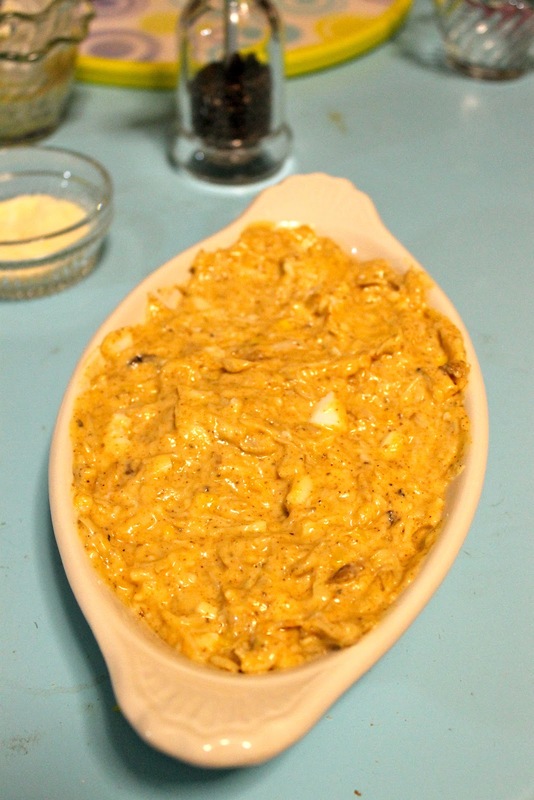 Add in your Old Bay seasoning, mustard and mayonnaise. Grind some fresh pepper in there and stir it up to combine really well. Place the mixture into a serving dish. Top with parmesan cheese (or poppy seeds). Let it chill and set in the fridge for at least an hour. Serve with crackers and watch it vanish before your eyes.